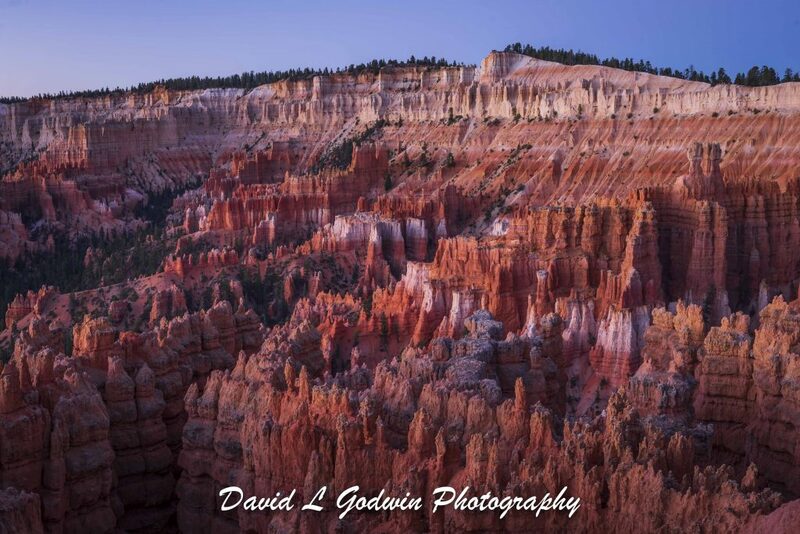 This next image was taken just moments before the sun rose above the walls of Bryce Canyon. It is quite bright outside and you can see the thousands of Hoodoo’s across the field of vision in the camera. I was shooting with my wide angle 24 to 70 zoom lens. In this image you can see the valleys and corridors very clearly. I love the complexity of the image, but you can see a large portion of the erosional effects. The colors are very vibrant and range from wide, orange, brown, pink and red. In just a few minutes the sunlight will fill this basin and the colors from the reflected light will cause the entire color palette to go off in an amazing display of beautiful light ! It was wonderful to be able to witness this spectacle.